Sydney Roosters have left no stone unturned in their quest to equal Wigan's record of four World Club Challenge titles early on Monday morning. The NRL premiers face off against the Super League giants at the DW Stadium (0600 AEDT) with 13 of the squad that won the NRL grand final set to feature against Adrian Lam's side. Coach Trent Robinson brought his side to Paris to prepare for the game rather than head straight to the UK, training daily at the well appointed French Institute of Sport, home to the country's Olympic training camp. 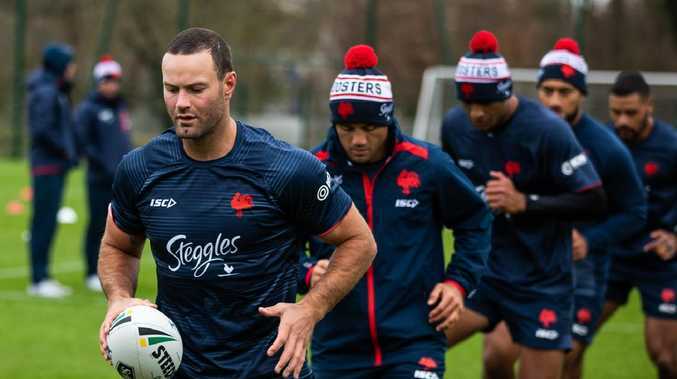 Wednesday's opposed session against French side Toulouse was followed by a similar exercise on Friday against Super League minor premiers St Helens, coached by former Roosters assistant, Justin Holbrook, following the team's arrival in England. With the NRL season not kicking off for another month, Robinson's side are behind Wigan in terms of match fitness with the Super League campaign starting two weeks ago. Despite this, the two-time premiership winner is only interested in victory and preserving the Roosters' proud 100 per cent record in a competition they have won three times. Victory over Wigan would equal the Warriors' record of four world titles and Robinson said that milestone gives the match some extra spice. "They have built from week one to week two of their season and got some combinations going," Robinson told AAP. "There is some consistency from the style they played under Shaun Wane. "They are developing Zak Hardaker into their playmaker from fullback and have a good player in the halves in George Williams and I think slowly over time Adrian's style will start to come to the fore. "I expect a stiff contest on Sunday and I think it will be a great test for us leading into our season." Lam worked as a coach in the junior ranks at the Roosters before taking the reins at Wigan, but he won't get the chance to coach against his son Lachlan, with the young playmaker missing out on a place in the team with Luke Keary and Cooper Cronk fit to start. "I know Adrian well and he has played a big role in the development of some of our players who will be on the field," Robinson said. "He's also been a great player for both the Roosters and for Wigan and I think it will be a great moment for him to coach Wigan against us and make for a memorable occasion." Former Penrith winger Hardaker, whose career has been blighted by off-field issues, is expecting Test match-like atmosphere for the match, which is set to be played in front of a crowd of over 20,000. "The week's build-up is like an international," Hardaker said. "Wigan is a big rugby league town and all the fans have been excited about it for the last few weeks. "We're going up against the likes of Cooper Cronk, James Tedesco, Jared Waerea Hargreaves, Boyd Cordner, the list goes on and when I speak about them it just gets me excited. "You want to play against the best and that's certainly what we'll be doing on Sunday."